Oklahoma state Rep. John Bennett (R) has not shied away from the controversial, anti-Islam comments he's made both on Facebook and at rallies in the past, and it seems like he won't anytime soon. Bennett again defended the statements in an interview with HuffPost Live on Monday and said he'd argue Islam "is not even a religion." "I stand behind them wholeheartedly," Bennett told host Alyona Minkovski. "First off, I never said Muslims were a cancer, I said Islam ... I would even submit to you that Islam is not even a religion. It's a social political system that uses a deity to advance its agenda of global conquest. That's exactly what ISIS is doing now, and people that follow Islam are and will do the same thing." Also joining the conversation was Adam Soltani, director of the Oklahoma chapter of the Council on American-Islamic Relations, who said he received death threats after Bennett's comments. "I received a phone call from an individual who asked if I was the director of CAIR and I said yes. He said he thinks I should be beheaded and so should every other Muslim in America," Soltani said. "What he said about the holy Quran, the holy scripture of 1.6 billion Muslims worldwide is absolutely false. It's just lies, it's hatred, it's bigotry." "Those Muslims. Our schools. 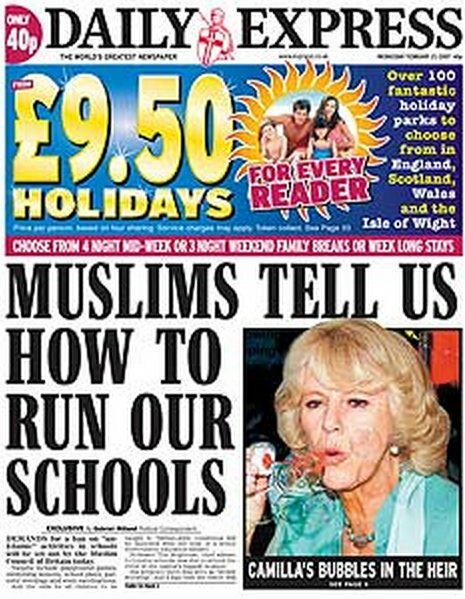 The idea that Muslim children, Muslim parents, are as much part of the British schools culture, the British schools system, as anyone else just isn’t considered, just isn’t even entertained, at all, in this particular front page headline," says Hasan.